The International Organization for Septuagint and Cognate Studies produces an annual journal, the Journal of Septuagint and Cognate Studies ( JSCS ). For issues 1 through 43, it was known as Bulletin of the International Organization of Septuagint and Cognate Studies ( BIOSCS ). 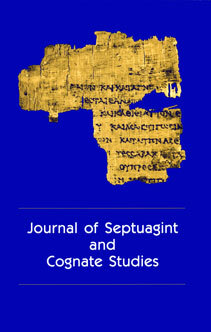 With issue 44, the name changed to Journal of Septuagint and Cognate Studies . Under either name, the Journal is the periodical publication of the IOSCS. Each issue contains articles, book reviews, notices of recent dissertations, and society information. The JSCS is indexed in the ATLA Religion Database, Old Testament Abstracts, and New Testament Abstracts. The Journal's Editor is Siegfried Kreuzer. An Editorial Board with native competence in French, German, and English assists the Editor with the peer-review process for articles submitted to the Journal, and with policy and procedures for the Journal. The current Board consists of James Aitken from Cambridge (UK), Cécile Dogniez (Paris, France), Siegfried Kreuzer (Wuppertal, Germany), and Ross Wagner (Duke University, USA). The Journal is sent to every current member of IOSCS. For subscription information, please visit visit our membership page. The major contents of the Journal are listed elsewhere in this website. Digitized copies (PDF files) of the first 43 volumes of the Journal are available. Printed back issues of the Journal are available from Peeters Publishers. Starting with issue 50 in 2018, we have a new publisher: Peeters Publishers. Eisenbrauns published issues 34 through 49. In 2017, Eisenbrauns became part of another publishing house. We are grateful for 20 years of fruitful collaboration with Eisenbrauns, and we look forward to collaboration with Peeters Publishers. The International Standard Serial Number (ISSN) of the JSCS is 2325-4793. The ISSN of the BIOSCS is 0145-3890.